S-5-N Metal Roof Clamps - S-5! The new design features an innovative insert that ensures a superior fit whether placed on older profiles or new and wider nail strip profiles. 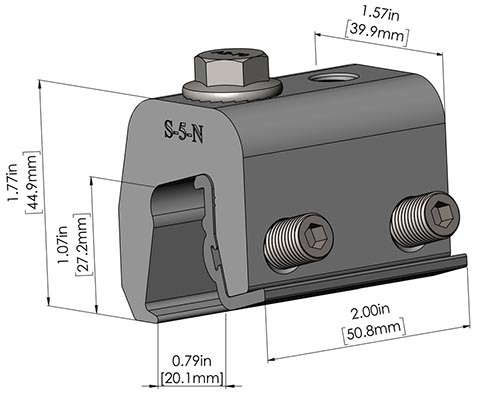 The redesign of the clamps fits the popular 1″ nail strip metal roof manufacturers which include: Taylor Metals’ Easy Lock™, ASC Building Products’ Skyline Roofing®, McElroy Metals’ Meridian, New Tech Machinery’s FF100 and roofing types with similar profiles. Both Clamps come with the set screws and M8 bolt.